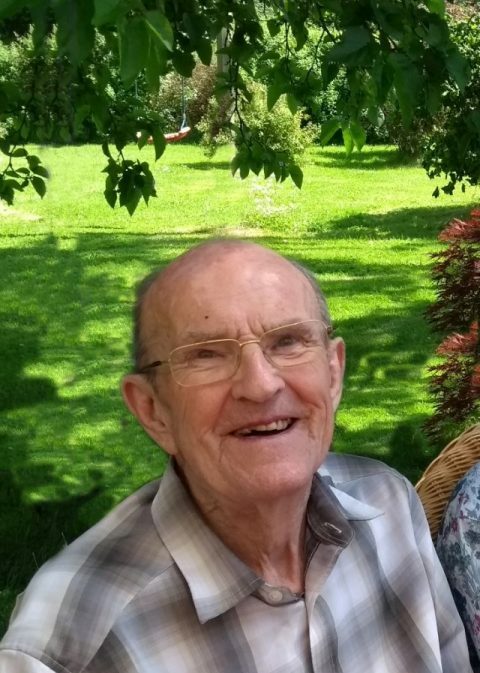 Peter May-Miller died at St Thomas’s care home Basingstoke on 12th December 2017. A Service of Thanksgiving was held at St Mary’s Church on 20th January. Peter moved to Old Basing in 1968 with Hilary and their five children. He taught at the newly-established Cranbourne Bilateral School, taking oversight of pastoral care in addition to teaching French. He organised and led Anglo-French summer camps in the UK and France and when Basingstoke was twinned with Alencon in the early 1970s, he became involved with pupil exchanges, visiting the town and building friendships which have lasted over 40 years. A keen sportsman and cyclist, he was known for the support, encouragement and coaching that he gave to young people in a variety of pursuits. Even into his 70s, he enjoyed cycling in the Hampshire countryside. A keen participant in the Old Basing Village Show, he won prizes for home-grown vegetables, home-brewed wine, cakes and jam. In an active retirement Peter studied Spanish and led the village U3A French conversation group. The family attended St Mary’s church and have been involved with the church for almost fifty years, Peter and Hilary each taking a variety of roles in services and administration. Peter sang in the church choir, performed in local theatrical productions and sang for many years with the Basing Singers. Peter was known for his gracious and friendly character, his commitment to a generation of Cranbourne schoolchildren and his enthusiasm and warmth. He will be sadly missed by his widow Hilary, five children, eleven grandchildren and three great-grandchildren. Many others in Basingstoke and beyond have lost a dear friend and role model. Hilary and the family would like to thank their many friends in Old Basing, Lychpit and beyond for the letters and cards they have received which have been very much appreciated. There is to be a Service of Thanksgiving on Sat 20th January at 11.30am in St Mary’s Church, Old Basing. They were glorious years of Hampshire education and human warmth. The staff and pupils gelled and relationships blossomed which have held ever since. Sadly, many are now no longer around but Peter was a stalwart staff member and along with Hilary and his’ large ‘ family were particular items of friendship and good humour throughout the school.